The 1,175-point plunge last Monday – a 10% decline from its recent peak – wiped out gains for the year and pushed the Dow into correction territory. The historically low market volatility experienced in recent months spiked as the Chicago Board Options Exchange Volatility Index (VIX) – commonly used to gauge investor fear – jumped by more than 100%. VIX is also at its highest level in the last five years, above the "flash crash" of August 2015. While there is fear among investors, Citi analysts believe that this recent development is merely a market correction as fundamentals such as GDP and earnings-per-share (EPS) growth remain positive. Citi analysts are also reassured that the equity rally has been driven by EPS. As such, they believe that either a shock in USD, growth, market/liquidity or inflation is needed to break the equity bull market. Citi's US equity EPS growth forecast for 2018 rose from 11% in December to current level of 14%. Citi believes that the biggest driver of this upgrade is the US corporation tax cut. 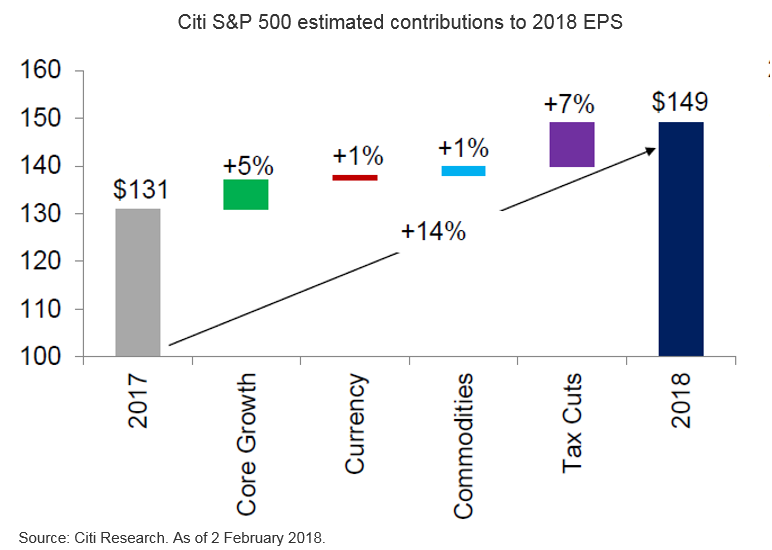 Citi analysts also expect the 14% EPS growth in 2018 to be supported by core business improvements (5%), a weaker US dollar (1%) and rising commodity prices (1%). Tax cuts make up the other 7%. Citi analysts remain neutral on US equities, despite the recent sell-off – but identifies emerging market equities, financials and materials as potentially attractive opportunities for investors.